Partners in a project in India and Mozambique to raise rural incomes through goat rearing have produced a manual to help paraveterinary workers and farmers, especially women and other marginalized groups, transform their goat raising from an informal activity to a viable commercially oriented enterprise. The project, known as imGoats, or ‘Small ruminant value chains to reduce poverty and increase food security in India and Mozambique’; was conducted from 2011 to 2013 by the International Livestock Research Institute (ILRI), India’s BAIF Development Research Foundation and Care International (Mozambique). It was funded by the European Commission through the International Fund for Agricultural Development (IFAD). Titled Goat Production and Commercialization, the manual takes the form of a flip chart, with visual aids, illustrations and simple explanatory texts on major topics related to goat rearing, including feeding and health, reproduction and commercialization. Information in the manual was produced by BAIF and Care International from experiences with the imGoats project in the two countries. It is available in both Hindi and Portuguese. Saskia Hendrickx, ILRI project manager for imGoats, says the manual should be of use to paraveterinary workers, who serve rural villages in these and other developing countries, and farmers wanting to step up their goat production. In India, Hendrickx says, copies of the book have been shared with BAIF, central and state animal husbandry departments and research institutes. 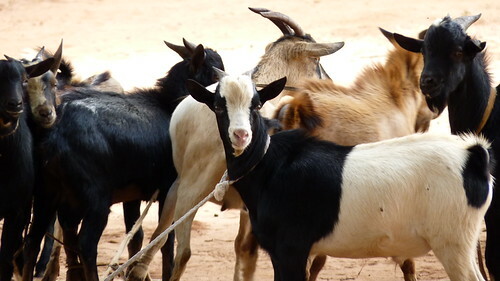 In Mozambique, those using the manual include ministry of agriculture officials, researchers at the Institute for Agricultural Research of Mozambique and livestock service officials in Inhambane Province, where the imGoats project was implemented. Download the manual in English here. Download the manual in Hindi here. Download the manual in Portuguese here. Watch a 3-minute film about imGoats in India. Watch a 4-minute film about imGoats in Mozambique. Tags: BAIF, Care International, imgoats. Bookmark the permalink. Thanks for the wonderful news on the transformation of the goat farming into a business. I am highly interested to see the English version of the resultant manual. Please email me a copy when it is ready. Hello, thanks for your feedback. The English version will also be available from this same address. please check again in 2 weeks or so. Thanks for publishing this manual in Hindi. It will be very useful for the general people like me. Thank you very much. your download links are not working. Tes it is working now. thank you. I meant Yes it is working. What a great basic manual. Good job. Viable business. Great article, we wish everyone success.